All I can say about these walls is "Wow." I can't imagine that is wallpaper, which means, it's painted on. Can you imagine how long it took to do that. The person must have had the patience of a Saint. It turned out beautifully though. So, so happy. I need some of these walls in my life. 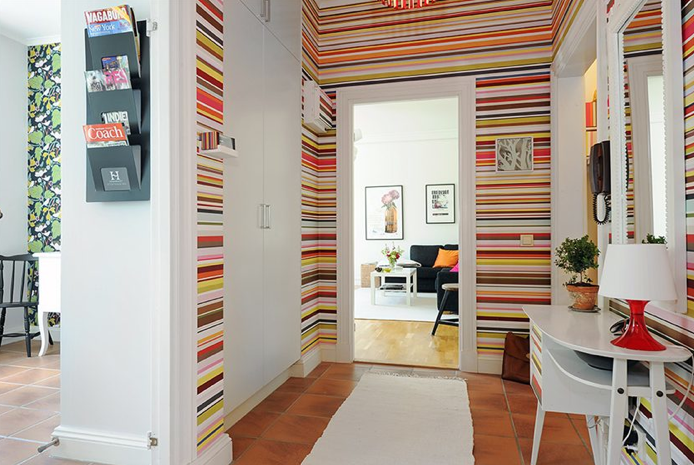 *UPDATE* - I was informed that this is a pic of an apartment in Sweden and that it IS actually wallpaper. Ok kids, sniff it out and tell me where you can get it. Oh that's awesome. I also love how the stripes are also on the front of that desk. I can't imagine actually doing this though. I used electrical tape to make black and white stripes on one wall of my apartment and almost drove myself crazy haha! The stripes really make the space wider and brighter. Great job! I can't even begin to imagine how much work this would be. Crazy but incredible impact.. though not my style! :)If it were in someone else's house I'd ooh and ahh I'm sure! That is insanely cool and you are *SO* right, that person is a SAINT! love the creativity!